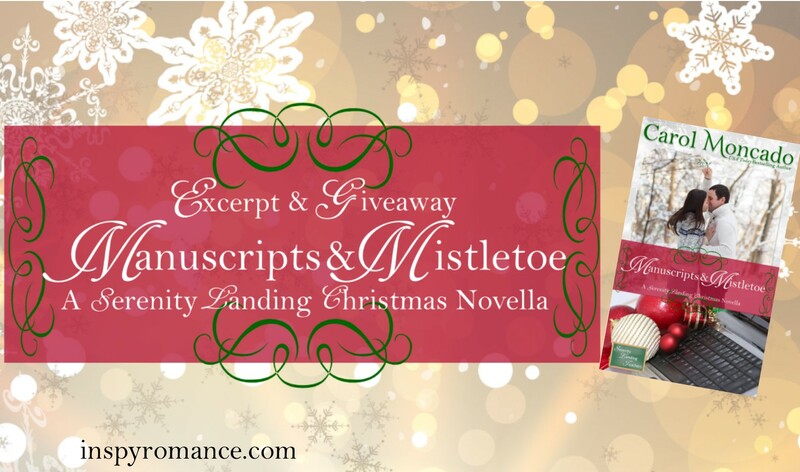 Manuscripts & Mistletoe Excerpt & #Giveaway! Hey, InspyRomance Friends! Isn’t December grand?! Of course, it’s currently the 3rd as I’m posting this, and I’m spending the first four days of the month with Ginger Solomon at a writing retreat – where we’re doing more retreating than writing it seems – at least the first day and a half at least. Both of us had crazy, crazy Novembers, and we needed the down time! One thing I did manage to do is get Manuscripts & Mistletoe to her so she could proofread it so I could get it posted! YAY! It released December 1! 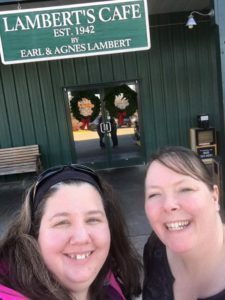 I do love this story and hope y’all do, too! Here’s the first little bit! Missy Solomon tapped her finger on the table. Her idea of “on time” was ten minutes early, but this was getting ridiculous. The Christmas party committee meeting should have started eight minutes earlier, but no one else had arrived. Suddenly uneasy, she pulled her phone out of her pocket and checked the email forwarded to her by Mrs. Diablo. After deliberating a few more seconds, she went back to the classroom to find Mrs. Diablo packing her things for the long weekend. She’d be out the door as soon as three o’clock hit. Apparently, the admins were hawks about who left early on a holiday weekend. For all her supposed academic prowess, the not-quite-elderly teacher was grumpy enough for the whole building. Missy pressed her lips together to hold back the retort she longed to give. Cell and data reception in the building was terrible, and Mrs. Diablo told her she wasn’t allowed on the faculty Wi-Fi – or to use the computer. Just a few more weeks, Missy told herself. Three more weeks until she was done. Three more weeks until she had her degree and teaching certificate. Three more weeks until she found out if she was taking over for the retiring-before-spring-semester Mr. Gunderson four doors down and across the hall. Missy grabbed her already-packed bag and headed for the stairwell on the other end of the building. Despite her recent workouts, she was out of breath by the time she reached the second floor. Three teachers walked out of the classroom, all going the other way and didn’t see her. She’d missed the whole thing. The door was propped open, so she walked in. Mr. Smithton looked up from putting a folder in a bag. Right. Directly beneath Mrs. Diablo’s room and on the other side of the school. “Thank you.” She turned and walked out before hurrying down the hallway and around the corner where she wanted to groan at how much further she had to go. As she passed room 208, a young man, about her age, walked out of the next room, bag slung over his shoulder. Missy blinked. “Sure.” She didn’t have plans, but she wasn’t sure she wanted to spend the first evening of a long weekend planning a Christmas party either. At least he was cute, and she’d heard the kids liked him. All righty. This could be an interesting night. Or it could be the most awkward hour of her life. He was cute, but this could turn out to be a nightmare. 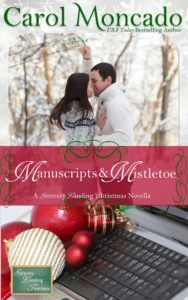 Let me know your favorite part of Christmas in the comments and one lucky commenter will get a Kindle copy of Manuscripts & Mistletoe! So what’s Manuscripts & Mistletoe about? I am from South Africa and here there is only sunshine and summer rains at Christmas time. I live alongside the South Coast of Kwa-Zulu Natal which is next to blue seas and white sands. I think my two girls would love to have a white Christmas, but I am partial to the sunshine! Thanks for sharing the excerpt, Carol. I’m excited to read it. As for Christmas, I love everything about it, especially time with my family. Merry Christmas to you and yours! There are so many things I like about Christmas. One of my favorites is baking with my kids when they are both home from college. Thank you for sharing a little bit of your book with us. It sounds great. I love Christmas. I enjoy Christmas lights. My favorite part of Christmas is baking (and eating Christmas cookies throughout Advent season–mom used to want to wait until Christmas and we’d be stuck with tons of cookies for the new year.. then we manage to convince her that Christmas cookies are meant to be eaten during the season, not after; and we won!) and going to Christmas Eve service (it is mostly filled with music and readings, which makes for an interesting evening since everyone that plays an instrument is invited to join the mini orchestra they put together; my sister and I always play with them and now we’ve got our husbands involved too; it is really fun to see kids and elders–and everyone in between–playing together every year, some families have many generations involved; I’m looking forward to see my kid playing someday). Hmm. Favorites…. Christmas Eve service with its candlelight and carols. The grandgirls’s eyes when they open their Christmas stockings. The get-together with my sister’s family. So jealous you and Ginger spent a few days together! Next time, invite me! Yeah, I know I don’t live anywhere near the SE quarter of the USA. Carol, I love how you gave your character, Missy, Ginger’s last name. I have this on my Kindle and looking forward to reading it. This Christmas will be extra special since it will be the last Christmas for awhile that our daughter and son in law will be in our area to celebrate Christmas with us. Today my 37 year old son in law enlisted in the Air Force. This is a dream come true for him. He has worked hard towards this goal. We are very happy for the two of them. Sad to say his parents aren’t taking it as easily. I can understand their feelings but we are happy for them since this is something they both really desired and wanted. I’ll be back to reply more later but I love reading these!!!! As a retired teacher, I enjoy this series about teachers. Christmas is my favorite holiday and I enjoy seeing the season daily through the eyes of my grandchildren – ages 11, 9, and 3. My three year old granddaughter is enjoys making crafts. Today was her day for treats and we took applesauce snacks and added eyes, nose, and antlers for reindeer. I enjoy celebrating German Christmas traditions – Advent wreath, Advent calendar, and today is St. Nicholaus Day. The family was on the nice list and we all got treats. Looking forward to our family celebration on December 23. This year we are having a gingerbread house contest (new tradition this year). Also instead of ugly sweaters, I use fun colorful socks as stockings and we all model them at our family Christmas (new tradition last year, but continuing this year). Fun to see our grown sons having fun. They enjoy the fact that mom comes up with something new and is young at heart. There are a lot of things I enjoy about Christmas. I love the music, and try to attend at least one Christmasy concert each year. I also enjoy the Hallmark movies and reading Christmas stories. But mostly I enjoy the general feeling I get this time of year and the time I get to spend with my boys. Being with my family, sharing the story of Jesus birth. Seeing the faces of my grandchildren as they open their gifts. I’m looking forward to reading the book. I love Christmas, the time away from work, catching up with family and remembering that Jesus humbled himself to become a baby, just for us! We had our high school graduation last night, so nice to see my awesome year 12’s (senior) graduate. I love reading your favorite parts of Christmas!!! They’re awesome!!! Winner announced Sunday! My favorite part of Christmas is having the family together and celebrating Jesus’ birth, which we really do every day. You are a new author to me, but I enjoyed this blurb, so I look forward to reading your book. Have a merry Christmas!!! I’ve also discovered a few new Hallmark Christmas movies that I’ve enjoyed watching. Since we don’t have a TV subscription, I’ve been able to watch them on YouTube :-) So fun! !